One of the most difficult tasks identified for Java 9 Compatibility is refactoring the GeoTools library to be compatible with the Jigsaw module system. CLASSPATH: This is the unstructured free-for-all we know and love. MODULE PATH Automatic Modules: This is the middle lane, jars are handled as modules with a couple of assumptions (a name is assigned, and all their public packages are published). Since they are in the middle lane they can merge left or right - accessing anything on the CLASSPATH ... and anything on the MODULEPATH! 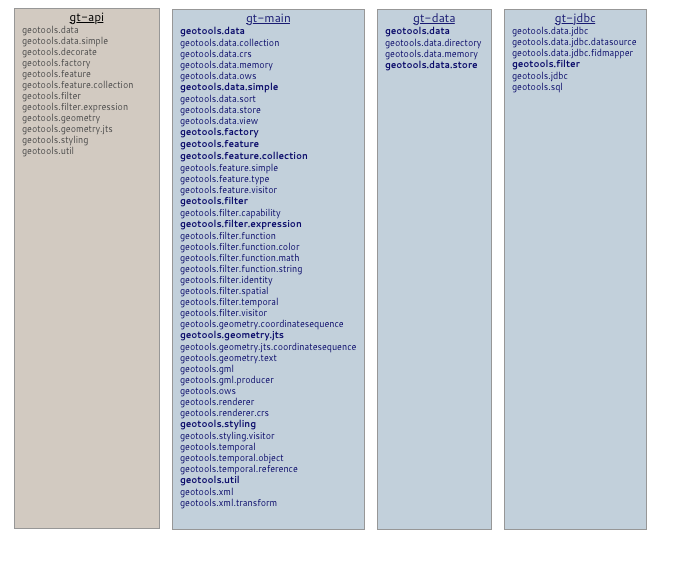 Using automatic modules as a bridge to the CLASSPATH, the long-term vision for the GeoTools library is to use this three-lane system out our advantage. A normal module like gt-renderer defines a SPI interface ExternalGraphicFactory. It makes use of SPI to locate implementations that have been shared using ServiceLocator. The gt-svg automatic-module provides an implementation of ExternalGraphicFactory making use of the apache batik library. As an automatic module gt-svg can access anything on the CLASSPATH and the Factory isAvalable() method will check if batik can be found, with the specifics reported by getAvailableStatus(). It can also see all public MODULEPATH packages giving it a chance to implement ExternalGraphicFactory. There is a catch-22 for use of the module system known as the module hell problem - although steps have been taken to make the transition easier it is important that java libraries such as GeoTools make a release as early as possible that includes an automatic module name (even if they still build with Java 8). This allows downstream projects to transition to Jigsaw and not be held up by the GeoTools project. Do nothing, this works for single jar projects. The jar can be added to the module path and used by depending on using a module name based on the jar filename. This is how untouched jars built in Java 8 appear when placed on the MODULEPATH. As shown above this approach ends up including the version number in the dependency. As module dependencies are transitive it makes subsequent updates very difficult to orchestrate. Provide an automatic module name using a MANIFEST.MF entry, the provides stable module name for use in Java 11, while still being built in Java 8. This is the approach we intend to use for the restructure. It is also the approach we intend to use long term for plugins (since an automatic module can act as a bridge between the module system and JDBC Driver on the CLASSPATH). Make a selective build, that builds a normal Java 8 jar as gt-main-21.0-java8.jar, and a Java 11 jar as gt-main-21.jar which includes a module-info.java file. The use of module-info.java would result in less disruption to the codebase, as it allows some packages to remain unpublished (only accessible internally or via an SPI factory). This is a tradeoff for consideration by the PSC. Our architecture diagram shows a split between the jars providing key public API and the implementing modules. This approach will not work on the MODULEPATH, as no two jars can "publish" the same public package. The first layer of our architecture shows several conflicts between the API defining a package, and the implementation making use of the same package. 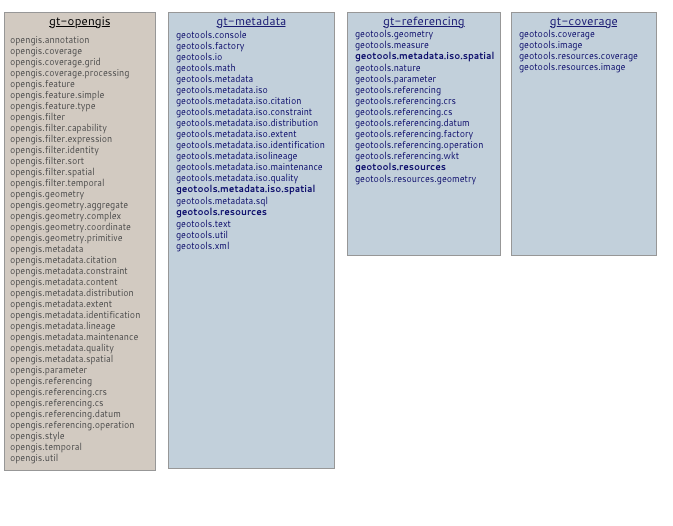 As an example gt-metadata publishes org.geotools.metadata.iso.spatial, this prevents gt-referencing from loading. 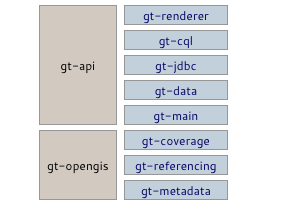 The second layer shows additional conflicts between gt-api publishing packages, and implementations trying to provide abstract classes to help implementors, and facade classes to assist with ease-of-use. As an example gt-api publishes org.geotools.data, preventing gt-main from loading. In the above diagrams noted conflicts are marked in bold. Considered: Removing the gt-opengis and gt-api jars and distribute the interfaces and abstract classes along side the implementations. Goal is to cause the least disruption, and not change classnames so that "organize imports" can fix any problems. Ideally we can record the refactor in an IDE, and replay it for each affected downstream codebases. No major changes, utility classes moving to util folder. Individual plugins may also run into split-package conflicts, most often when they provide their own utility class or filter. In each case the implementation the core-library gets priority and the plugin is repackaged appropriately. In these cases we may need to adjust the package visibility used to provide privileged access to these implementations. If we were using normal modules we could grant additional access, as it is we are using automatic modules and will need to make any required API public. Moving pages to match the revised library structure. Goal is to maintain working code-examples showing library functionality (even if the text is out of date). This refactor goes beyond search and replace, provide IDE specific update instructions to fix imports. 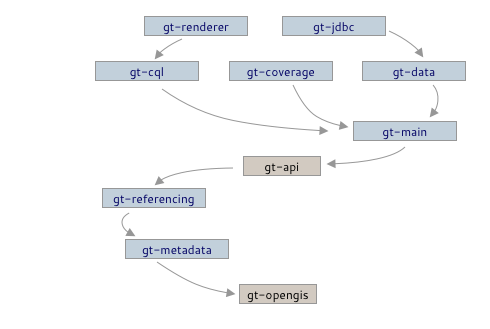 refactor gt-opengis into org.geotools packages and redistribute across library modules. To better act as a bridge with the CLASSPATH the following change is proposed to the GeoTools factory interface. Allows modules to both check and report back if they found their required dependencies on the CLASSPATH. As shown during this transition the package hierarchy will be flattened if appropriate. This change is an alternative to [Resolve-GeoAPI-3.0.0-Incompatibilities] which has not attracted a contributor, and is likely to cause considerably more conflict on the MODULEPATH.